You still have a few old school collectors and dealers who look upon the Peace Dollar as more numerous and less valuable then it’s counterpart the Morgan Dollar. However such is not the case when you step outside the dates 1922, 23, 24, 25 with their high mintages, since the rest of the dates and mints are more rare. You can still buy low grade and common dates and mint Peace Dollars for as low as $25 but this might not reflect future trends as more people turn to Peace Dollars due to the rise in value of the Morgan Dollar. Also remember that it’s not the age that determines a Peace Dollar’s value, it’s the amount that was minted and how rare they’re in certain grades. (More on grades later in this guide). In example, an 1928 Dollar is the key date and has a mintage of 360,649 as they came from the U.S. Mint, but fewer than that have survived. So this coin is worth well over $200 even in the lower grade like G4. 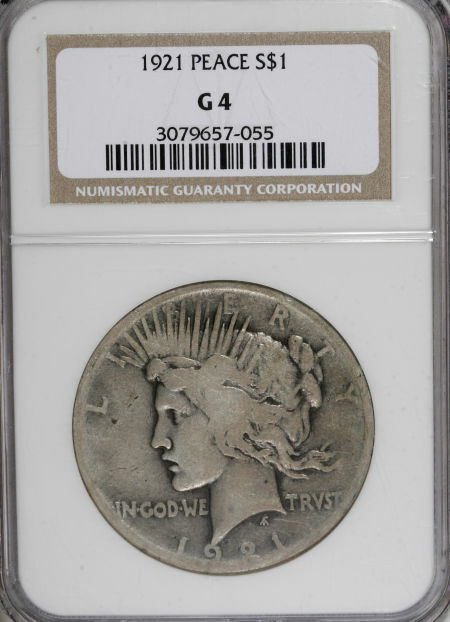 In contrast the the 1921 Peace Dollar had a mintage of 1,006,473 and in the same G4 grade can be bought for around $50. (Note: Two silver dollars dated 1921 were issued and the other is a Morgan Dollar dated 1921 and it’s less valuable than the 1921 Peace Dollar). Peace Dollars are valuable in the higher grades and some dates and mints more than others. The starting desirable grade for common date and mint state or uncirculated Peace Dollars is MS63 (Mint State) but the most value begins at MS65 and above as these are “gem” BU (brilliant uncirculated) examples. However there’s some dates and mints that become valuable in grades less than mint state and 1934-S is one example. 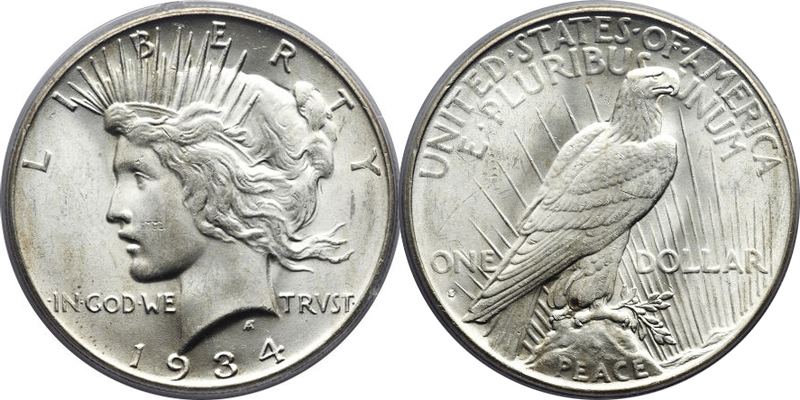 The 1934-S Peace Dollar value starts with examples in AU (about uncirculated) grades despite the over all higher mintage, but because the coin circulated more than most, and many became worn, melted down or were lost during their circulation, they’re more scarce in higher grades. You should always consult a legitimate price guide to see the values for each Peace Dollar date and mint, and learn how to grade them properly. You should also learn to recognize cleaned or altered surface Peace Dollars since this will lower the value as well. A VAM is an acronym of two men’s names that studied and basically wrote the book on Peace Dollar varieties. A Peace Dollar VAM is caused by an alteration to the die and it can be a change in the design, a large die break or a doubled die. Some can be extremely valuable and they’re rate as Hot 50 or Hot 100 and the higher the rank the more desirable and valuable, but as with any Peace Dollar value the grade and condition will still play a major factor in value. 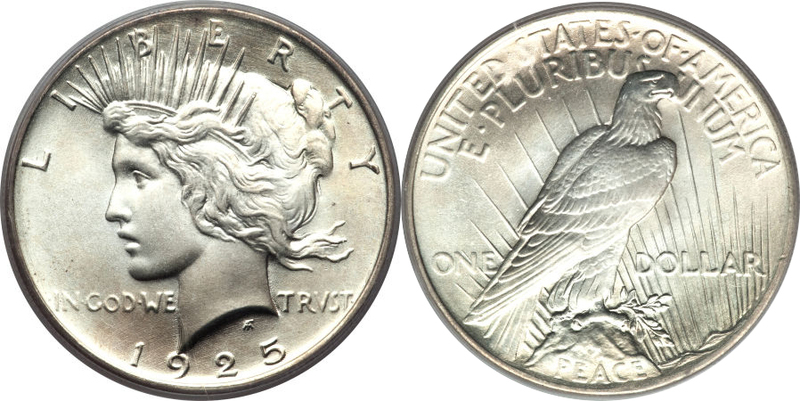 I recommend vamworld.com to learn about and help you identify Peace Dollar VAMS. Since a Peace Dollar consist of 90% silver and 10% copper then their base price for any grade, condition, date or mint is going to be the silver value. A Peace Dollar value depends on the current market price, so use this formula. Melt Value (90% Silver Dollars) = Face X 0.77344 X Spot. Peace Dollar value is determined by mintage, grade, condition and if it's a variety or mint error.